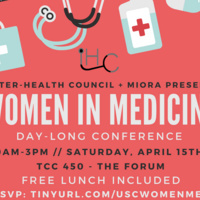 Join us at IHC's first conference ever, featuring incredible female leaders in the healthcare industry. The day will consist of TED-style talks with our esteemed speakers, and will be an amazing opportunity to get to meet and network with faculty at Keck, cancer researchers, marketing professionals, physical therapists, and more! Free lunch will be provided. Dr. Amy Ross received her Ph.D. in experimental pathology from the Keck School of Medicine at the University of Southern California and has since made major contributions to the study of cancer. Her work began in a cancer diagnostics lab, and she shortly captured the title of senior vice president of scientific operations at Nexell Therapeutics. She has also served as an associate biologist at the California Institute of Technology. Dr. Ross’s research allowed her to develop several tests for diagnosing early relapse in cancer patients. Three of her clinical assays for cancer diagnosis have been patented, and she has authored more than 75 scientific publications. Dr. Ross is also committed to service. In 1992, she helped establish USC’s first LGBT alumni group. She also helped found the National Organization of Gay and Lesbian Scientists and Technical Professionals. Dr. Ross is also a member of the USC Board of Trustees. Dr. Shireen Vali is Co-founder and Chief Scientific Officer of Cellworks Group. She has over two decades of experience in molecular and cellular biology research and development. She was instrumental in building the Cellworks R&D organization spanning multiple disease indications from initiation to size of over 100. Under her management the R&D organization met development milestones for in-vivo equivalent technology representing disease physiology with complexity in range of half a million signaling and metabolic cross talk interactions. She also oversaw the development of pipeline of therapeutic programs for cancer and immunology. She has presented and co-authored many international publications; holds a PhD, Neuroscience from U.C. Davis and completed fellowship at Stanford University. Dr. Valerie Mumper is an Instructor of Clinical Physical Therapy. She has a hybrid schedule of both clinical practice and academic teaching. It is within the Keck Hospital of USC Faculty Practice, where she primarily treats patients with cardiovascular and pulmonary dysfunction. She also treats within the Center for Cystic Fibrosis at USC. While in the classroom, she serves as the course coordinator and a primary instructor for the second-year Patient Management of Cardiovascular, Pulmonary, and General Medical Conditions course within USC's Doctor of Physical Therapy program. Loretta (Lori) Scime “Passion, Pride and Persistence” says Lori Scime, who has built her successful career as a Sales/Management/Marketing Professional in the Healthcare industry, through maximizing her continuous education, researching and gaining wisdom by applying objective and analytical properties from both her professional and personal life. Lori’s extraordinary combination of education; Bachelor of Science (Eastern Michigan University, 1990), Master of Business Administration (University of Phoenix, 2005), and Doctor of Management in Organizational Leadership (University of Phoenix, 2017), proven success in the healthcare industry, remarkable role model as a single Mom, and passion for sports, especially downhill skiing, biking and competitive volleyball; has made Lori the Maximizer, Analytical, Competitive, Relator, and Responsible person she is today. Brenda Kuhn is the Chief Quality Officer for Kettering Health Network. She is known as a strong and compassionate leader who cares deeply about creating reliable processes to improve patient outcomes and provide exceptional care. Brenda has a Ph.D. in Public Administration from the University of Southern California, a Master of Science in Healthcare Administration, and a Master of Science in Community Health Nursing and Nursing Education. She is a Registered Nurse having earned a Bachelor of Science in Nursing from Wright State University after completing her Associate Degree in Nursing from the Kettering College of Medical Arts. She began her career as a Critical Care Staff Nurse and has steadily increased her knowledge, experience and contribution to her profession serving the last 25 years as an executive in several health systems including UCLA and White Memorial Medical Center. Brenda serves on several Boards including the Mercy Health Quality Board, Kettering College Board, Dayton Christian School System Board and The South Metro Chamber of Commerce Board. She serves as a judge for the state quality program and serves as a merit badge counselor for boy scout troop 103. Brenda has a wonderful husband and 2 children. Lauren is a junior at University of Southern California studying International Relations. Matt is a freshman at the Air Force Academy. Dr. Yamada is an Assistant Professor of Clinical Physical Therapy at the University of Southern California’s Division of Biokinesiology and Physical Therapy. She works primarily as a physical therapist in the faculty practice, USC Physical Therapy Associates, with a focus on oncology and orthopedic impairments. She is certified by the American Board of Physical Therapy Specialties as an Orthopedic Clinical Specialist. She is also holds three other certifications: Certified Lymphedema Therapist, Certified Athletic Trainer, and Certified Strength and Conditioning Specialist. Within the Doctor of Physical Therapy program at USC, she teaches a musculoskeletal imaging course and also teaches within the oncology curriculum. She is involved in clinical physical therapy research and authored publications related to self-efficacy and low back pain. Her second interdisciplinary research area is management of patients after head and neck cancer treatment.